The current election to the Delhi assembly poses the threat of India going back to the time of failed socialist polity of populism, doles and subsidies. As is usual in the fight for capturing political power for self – aggrandizement, competitive populism is at its peak. Every political party is promising the poor everything either free or at heavily subsidized rates e.g. water up to a certain consumption limit for free and electricity at half the current rate. Of course, food forms a very attractive offer at just rupee 1 & 2 a kilo for wheat and rice respectively. Education too is free, with cash rewards for girl students, free laptops for high school graduates and cycles for rural residents. This indigenous programme is wrapped up with award of degrees to even low achievers and jobs under the various reserved categories. The poor have just to do one thing to earn all these benefits: vote for the party to enable them to deliver on these promises. How they are going to do that, nobody is bothered to ask. The poor don’t question; they just trust. The leaders don’t clarify; they ask the poor to just trust them. It is a relationship built on trust and not sound political or economic assessments or resources. In Delhi itself, the number of the poor exceeds 7 million. It casts a powerful magnetic pull over the poor to migrate to Delhi. Election time promises do not lead to genuine improvement in their living conditions. The misery the migrants undergo for decades is worse than hell but still better than the hunger, deprivation, fear and exploitation of their villages. Caught between the Devil and the deep sea, these poor accept a life of never ending misery. Life in the beginning depends on the mercy of the local musclemen, political leaders and corrupt officials. They are called “Pradhan” or Chief, as in rural India, but unelected and self-appointed. They come to exercise such influence due to politics, crime and corruption. They are everywhere, from a Gali (street) to Mohalla (Neighbourhood) to the whole Colony/ Area/ Locality/ Ward. They control the territory under their sway. It is through them that identity cards are made, making the poor eligible to get government doles or school admissions or jobs. They are linked to the local politicians or Party Workers, who in turn are connected to the municipal councillor, MLA (Member Legislative Assembly) and MP (Member of Parliament). They are part of the ruling party wielding influence over the government ministers and through them over the public servants responsible for delivering the services. So whatever benefit has to flow to the poor has to flow through these channels only. And the process is not fast; it has to be slow so as to ensure the success of the next election too. To finance such operations, governments resort to increase of administered prices like food grains or gas. It looks pretty impressive politics to increase the price of a product by 1% and reduce by half when people agitate. It leaves enough room to indulge in a lot of public speeches and recycle the same rhetoric of price control, subsidy and doles. Since the slogan flung by one political party spurs the rivals to coin a better slogan, it becomes a magnetic force by itself and when spun by the media, it acquires the status of a campaign. These campaigns for the poor bring up the survey specialists who declare results of the elections even before they are complete. These surveys actually are campaigns by the media in favour or against particular parties and are paid news/surveys/campaigns to sway the voters to their favourite party. While it ends up as a win -win situation for all, it is a lose -lose situation for the poor. It is in the name of the poor that Nurseries of Poverty are intentionally reared. That is the reason for stunted growth of countries like India, because it affects policy making, programmes and plans for growth, development and improvement in living standards of the masses. Delhi is actually picking up the bills of other states, which have failed to provide their domiciles these minimum facilities and good governance, spurring them to leave their homes behind. The number of such nurseries has only grown by the year. The labourers at construction sites or factories put up jhuggi-jhonpris or temporary shelters on public land illegally. What started as a humanitarian gesture soon attracted the greedy land mafia, who encroached on precious public land and started trading in sale, purchase and leasing such properties illegally. In this business they managed to obtain the patronage of the politicians and the bureaucrats, every one of whom benefited personally. The nation inspired by Mahatma Gandhi and Jawaharlal Nehru learnt its lessons in corruption rather too fast. The mafia raised individual criminals to execute their operations and guard their illegal assets. Their primary duty was to create vote banks for the ruling party, besides side businesses like bootlegging, drug pushing, human trafficking, smuggling, chain snatching, burglary. Over time, a sizable cadre of criminals evolved, who delivered chunks of committed votes to the party in whose employ they worked. They were used not only by the politician but by terrorist organizations too. Their contribution became valuable over time as both the ruling as well as the opposition parties were compelled to seek their services for assured votes, which generally tended to influence the results of the election. In the last few decades, they have also started contesting elections themselves rather than supporting candidates sponsored by political parties. These developments have created their own law & order problems everywhere. Senior police officers have been convicted for being complicit with such elements and so have the politicians. Delhi too has suffered. Safety concerns have become election issues. Power shortage and water scarcity is a nagging problem that has been giving recurring pain to almost all governments for more than 30 years now. Delhi is a special case in so far as it is the city where embassies of almost every country are located. Obviously the international intelligence agencies too are present in heavy numbers here. As India is a soft state, religious activists of foreign countries are equally active. For every activist operation, the structure of an NGO comes handy and how many NGOs are actually working in Delhi are not known even to the government. India is treated by them as a poor country and they try to push their agenda by pumping money through NGOs . These NGOs, in collusion with politicians and media houses serve their objectives without being noticed. That is the reason for the sudden surge in media surveys and projections of the results of the Delhi election on February 7, 2015. All TV channels are fervently trying to ensure victory of the Aam Aadmi Party and particularly its Chief, Arvind Kejriwal. In this campaign they have lost their moral sense of objectivity, neutrality and independence. It is a subject for research as to how and why the media has turned anti BJP (read Prime Minister Narendra Modi) so suddenly even as the government led by Modi has been functioning smoothly and successfully? Are foreign agencies fanning such euphoria for Kejriwal and hate mongering against Kiran Bedi? What has AAP or Kejriwal to offer to the people of Delhi or the NCT of Delhi? He has no political ideology, no roadmap for the city or the nation nor anything about international affairs like Pakistan, China, Bangladesh, terrorism, Al Qaida, ISIS, Greek crisis, energy prices, environment, industrialization and other critical issues. All that he talks about is subsidized water and power. One attribute that brought him success in 2013 election emanated from the high moral image of Anna Hazare, the Gandhian crusader against corruption, but this time he has got a superior match for that in Kiran Bedi, who too was equally active in the Anna Hazare agitation. Kejriwal has apologized for crucial mistakes made by him in the last stint as Chief Minister, which proves his immaturity to handle the demands of running a government successfully and satisfactorily. Can a person making critical mistakes after mistakes be ever entrusted the responsibility of running the government? While the voters will decide the results, it is mentioned only to highlight that such a person is acceptable to the foreign activists, who have been exploiting India for being a soft state all these years, but have got jittery after Narendra Modi’s victory and success. Delhi is more than valuable for them because of the publicity value enjoyed by the place. Managing and manipulating the media is the easiest thing in Delhi through partying. Delhi is the power centre and an extremely important world capital. Supervising, regulating and controlling Delhi serves the foreign policy goals of most countries of Europe, America, Africa, Australia, Russia, Arab countries and our immediate neighbours Pakistan, Bangladesh and China. It is equally a potential ground for religious conversions through irreligious means like inducement, blackmail or threat of various kinds. As India is a secular country which grants right to religion, it has been misconstrued to mean freedom to convert the poor people. These religious zealots from foreign countries enjoy the fullest support of their governments, whereas the government of India has yet to decide if any checks need to be placed on such anti-India activities, which are bound to threaten the very survival of the country after 100 or 200 years. As the country has suffered weak governments after 1962, these foreign interests were enjoying unwarranted freedom, but in Narendra Modi they find a new India, which is confident and resurgent. And this is what they detest and fear the most. They are motivated by their self -interests to attack Modi & his party and opt for Kejriwal & his party. They were at it during the elections to the parliament last year, but were let down by their surveyors and media, who had carried out a very vicious .campaign against Narendra Modi, painting him in poor colours as a person and politician, whom they did not visualize winning a clear majority and thus unable to form the government. The results not only disappointed them but shocked them. Modi’s foreign policy successes have crushed their hopes and his successes in assembly elections in Maharashtra, Haryana, Jharkhand and J&K have devastated the foreign forces and their Indian agents. The Delhi elections are their last hope. So they are out in the open in supporting Kejriwal. All opposition parties are ranged in a chorus making appeals to voters (regionalism at its worst) in favour of Kejriwal. But that is not of much interest to us at this moment as much as is the attack on Modi from his own party elements, foreign agencies and hostile media. Party lightweights of Modi have put him on notice by issuing an open threat that they can pull down this government. They are working against the party in Delhi election, if the statement made by one party MP from Bihar to the TV channels is any indication. How many dark horses are working against the BJP will be known only after the results are out. But it will be no surprise if some of them are found to be under the influence of these foreign forces. All of them, if successful, will harm India by dragging the country back to the times of licence raj. stalling the march towards a clean and liberal governance architecture. BJP loses. This will weaken the zealots within the party, but prove Modi’s line of thinking & development correct over all other side issues that have caused deep anxiety to all sections of the society, which came forward unhesitatingly to support Modi and deliver him a decisive mandate of a kind that only Jawaharlal Nehru enjoyed. AAP wins, governance suffers, shallowness prevails, confrontation with the central government aggravates, institutions suffer, law & order comes under stress, pockets of poverty multiply, crime rate rises due to protection in the name of secularism and poor. The charity mindset would not empower the poor to escape the clutches of the crime syndicates or acquire skills enabling them to earn their own livelihood without surviving on government doles. The Congress wins. It will revive corruption of the CWG, Coalgate, 2G spectrum auction etc. kind in no time and prosper manifold. 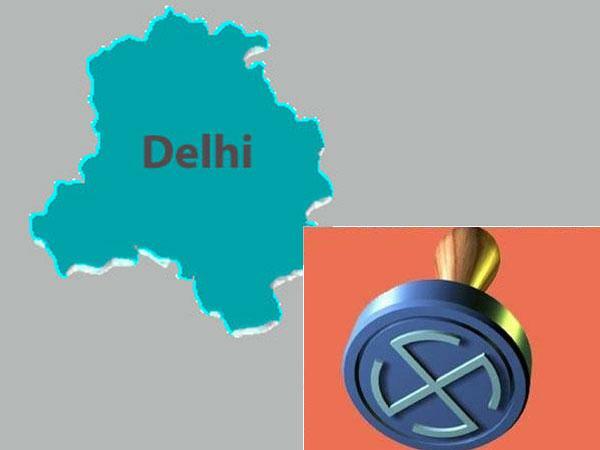 The Delhi voter has generally not been swept away by swings in local elections. The voter exercises his choice after careful consideration. Even the poor voters of Delhi are politically aware. They can even deliver a verdict making the BJP & Congress switch their numbers of pre-2013 assembly or BJP a clear majority with Congress at the same place where the AAP stood last year in the assembly and the AAP slipping to the position occupied by the Congress in the last assembly. It might also return a clear verdict in favour of the AAP. However, the excessive support of the TV channels betrays the possibility of the AAP not getting a clear majority in Delhi. Even if the AAP fails to get majority, it stands to gain as the partial success in Delhi would vindicate it as a political party of the future. That in itself would be a tremendous gain for a toddler of a political party of just 3 years of age! The stakes are too high for the Delhi voter this time. If they fail Modi, they reverse the development process in the country. This change has occurred at a time when the masses were suffering the whip strokes of a corrupt government on a daily basis. The people were hopeless, until Modi emerged on the scene promising better days ahead and hope for a dignified future for the country. He has successfully delivered on his promises as the Chief Minister of Gujarat for an unbroken 12 years period. He has the capacity, capability and people friendly agenda to bring about sustainable and enduring change. None of his rivals have that material at present. The masses understand it from their experience of poor performance of Arvind Kejriwal, communists, Mamata Banerji, Nitish Kumar and every other self-proclaimed secularist or progressive politician & Chief Minister. They understand the price they have to pay if they are weaned away from Modi on the basis of propaganda which has been practiced to perfection by his rivals and detractors and caused misery, poverty, unemployment and disease for the poor. These politicians talk the language of the feudal lords of yore in the same manner and body language when they promise to give the poor free education, health care, food grains, electricity, water etc. They behave as if they are the masters and lords and the poor are their raiyats or serfs. The people are fed up with such hollow rhetoric and want their rights to education, health, food and livelihood as guaranteed by the constitution of India. The people see in Naredra Modi one of their own, coming from as poor a background as theirs, whose mother continues to live in a very humble dwelling, unlike the rich and urbanized, educated and empowered politicians begging for their votes to make them beg them for everything from water to livelihood after winning the election. They are likely to support Modi, even though they are rightly angry with the BJP for its failure to restrain its loose cannons giving fright to the voters of Modi. Besides, the Chief Minister nominee is a woman, a former police officer of high reputation and an Anna Hazare camp follower anti-corruption activist. She is likely to get maximum votes of Delhi women voters, who get inspiration from her. This includes a large chunk of minority girls and women in particular. Delhi residents need to witness the modern empowered woman like Kiran Bedi to deter the street Romeos treating them like Eve only, so that crime against women become exceptions and not common. This entry was posted on February 7, 2015, 12:06 am and is filed under Articles, Current Affairs. You can follow any responses to this entry through RSS 2.0. You can leave a response, or trackback from your own site.